For those who are unfamiliar with the term, ERP stands for Enterprise Resource Planning. It is business management software that’s a whole package of integrated apps that help you manage various aspects of your business; planning, development, manufacturing, sales, marketing, data collection and more. ERP software improves business management by seamlessly integrating data between various processes. 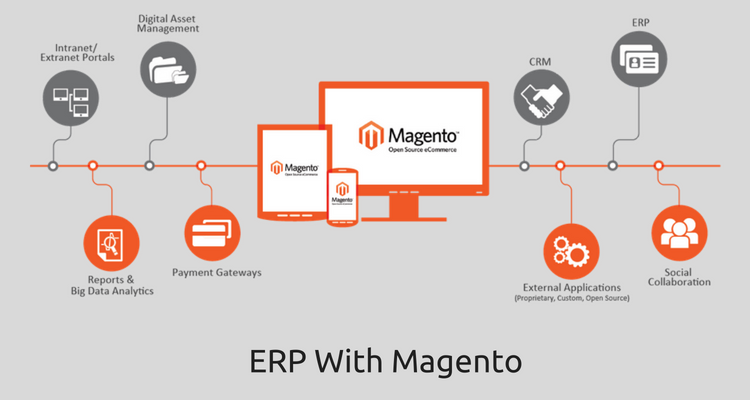 It is a godsend for businesses of every scale.For easy, hassle-free management, rapid business growth, and leaner customer experience, an ERP package of your choice can be integrated with your Magento store backend and front-end. There are many great ERP packages that integrate well with Magento. There is IBM, JD Edwards, Personify, Eclipse, Full Circle, to name a few. But there are three ERP packages that are unbeatable in terms of features and Magento integration. Great solution for rapidly scaling multi-site online businesses, Microsoft Dynamics AX provides comprehensive management solutions for Finance, Human Resources, and Operations. It can be used to automate customer accounts and order creation and integrates well with order fulfillment system, stock database, cloud-based finance and approval systems, and other enterprise grade features for marketing, SEO, shipping, and international expansion. Originally built for large enterprises and generally considered a B2B solution, SAP ERPs are now popular by large, small and medium sized businesses in over twenty industry verticals. And it integrates wonderfully with Magento. Real time inventory, pricing calls, promotional pricing, marketing campaigns, invoice creation, and seamless integration with other back-end systems are SAP ERPs strong suites. Nobel Biocare even achieved a 20 percent boost in traffic and launched new country sites within one week after SAP integration. This one is a powerful cloud-based ERP package created specifically to help medium scale businesses grow faster. It pays due attention to simplifying Order-to-Cash process (translates to faster checkout and order creation) and real-time data tracking and analytics (for better decision making with insights). The ERP is popular for its simple, easy to use features and the flawless integration with Magento. It is used by many online merchants across a broad spectrum of industry verticals to help manage and grow their businesses. ERPs are awesome, yes, but for them to be awesome they need to be integrated nicely and work well with Magento API. This task is a tricky one. Make sure hire Magento developers are well up to it. Helpful information. Lucky me I discovered your web site unintentionally, and I’m stunned why this twist of fate did not came about earlier! I bookmarked it.